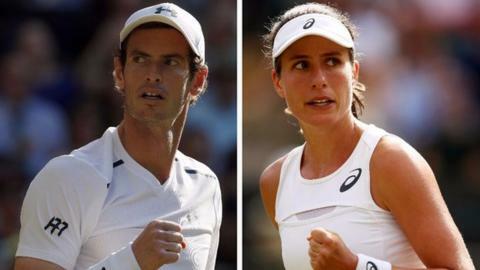 Andy Murray and Johanna Konta will try to reach the Wimbledon quarter-finals as the men's and women's fourth-round singles matches are played on Monday. The pair will attempt to give Britain a man and woman in the last eight for the first time since 1973. Sixth seed Konta plays France's 21st seed Caroline Garcia in the opening match on Court One at 13:00 BST. Defending champion Murray plays Frenchman Benoit Paire on Centre Court at about 15:00. A packed schedule includes eight men's and eight women's singles matches, and spectators began queuing over the weekend for the remaining tickets. In the men's draw, Roger Federer, Novak Djokovic, Rafael Nadal and Murray have 14 Wimbledon titles between them, while five-time champion Venus Williams is the only former winner in a fascinating women's event. Who will win women's title? The 37-year-old American opens play on Centre Court against 19-year-old Ana Konjuh of Croatia at 13:00. "I guess when you walk on the court, I don't think either of us is thinking about the age," said Williams, playing her 20th Wimbledon. "You're thinking, 'How do I win?'" They will be followed on Centre Court by Murray against Paire, before Federer takes on Bulgarian 13th seed Grigor Dimitrov. "He's in the prime of his career you would think right now," Federer said of Dimitrov. "I expect that every time I have played him he has become better. I expect the same on Monday." On Court One, Spain's two-time winner Rafael Nadal faces 16th seed Gilles Muller of Luxembourg in the second match, followed by Serbia's Djokovic against unseeded Frenchman Adrian Mannarino. It is 44 years since Roger Taylor and Virginia Wade carried British hopes into both the men's and women's quarter-finals, and Murray and Konta look capable of matching that feat. Murray, 30, has coped well with the hip injury that disrupted his preparation and came through his first serious test against Fabio Fognini on Friday in four sets. He now meets Paire for the second time, after winning a dramatic match in Monte Carlo last year that sparked a brilliant run of form which ultimately ended in the number one ranking. "He has very good hands, moves well, takes a lot of chances and goes for his shots," said the Scot. "He can be quite up and down. But he seems to have played pretty well so far at this event. I expect it to be tricky." Konta, 26, is doing her best to play down talk of being the tournament favourite but appears to have as good a chance as any of the 16 women left in a wide open draw. Garcia will have similar thoughts, however, and won their previous match in a final set tie-break in Indian Wells earlier this year. "I have said that everyone in the draw is in with a chance of taking the title," said Konta. "I think I'm pretty sure favourites also come and go. They change daily almost. "I'm just here, happy to have actually made it into the second week, happy to come through three battles this week." The second Monday of Wimbledon is one of the most famous days in tennis, as the only one of the four Grand Slams that schedules the last 16 men and women together on the same day. Germany's Angelique Kerber is trying to rediscover her best form, and at the same time hang on to her world number one ranking, with Spanish 14th seed Garbine Muguruza her next opponent. Such is the quality of matches all around the All England Club that this clash of the last two Wimbledon runners-up is the first match on court two at 11:30. At the same time, newly-crowned French Open champion Jelena Ostapenko of Latvia faces Ukrainian fourth seed Elena Svitolina, one of the form players of 2016, on court 12. "To be honest, I'm really not looking at the schedule," said Kerber. "I'm trying to think more about my game, it doesn't matter which court. I just go out there, try to play my game." Kerber and Muguruza will be followed on court two by an equally intriguing contest between Romanian second seed Simona Halep and unseeded Victoria Azarenka of Belarus. Halep continues to search for a first major title after losing in the French Open final last month, while Azarenka is making her Grand Slam return after giving birth to son Leo in December. Sixth seed Milos Raonic, the Canadian who lost to Murray in last year's final, completes the court two line-up against German 10th seed and rising star Alexander Zverev.